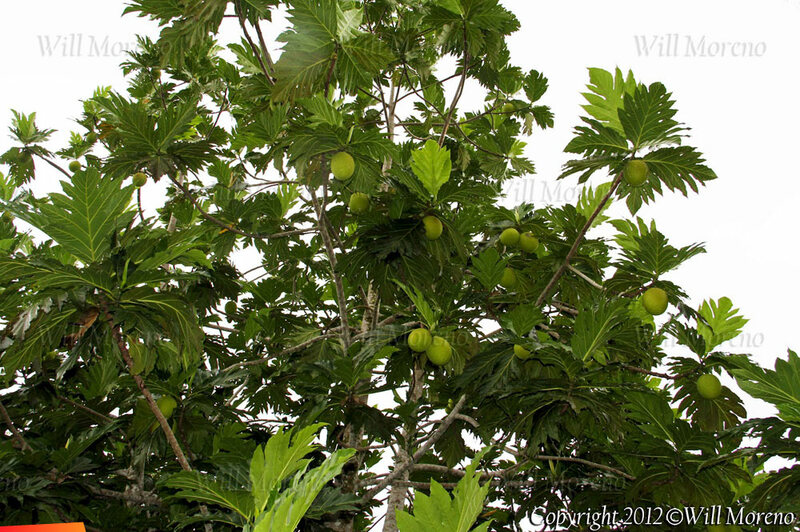 Yes, it sure is the season for Breadfruit in Belize. What is a Breadfruit, you may ask? Well, simply put, the Breadfruit is a remarkable food source. The Breadfruit has long been a staple in the diets of the Pacific Islanders, but was introduced into the Caribbean in the late 18th-century when the Bristish slave masters were looking for a very cheap food source alternative that was very high in nutrients to introduce into the diets of their slaves. This is the period the Breadfruit was introduced to the Caribbean. The Breadfruit is very rich in starch, carbohydrates, water and vitamin C, potassium and zinc. Before being eaten, they are roasted, baked, fried or boiled. 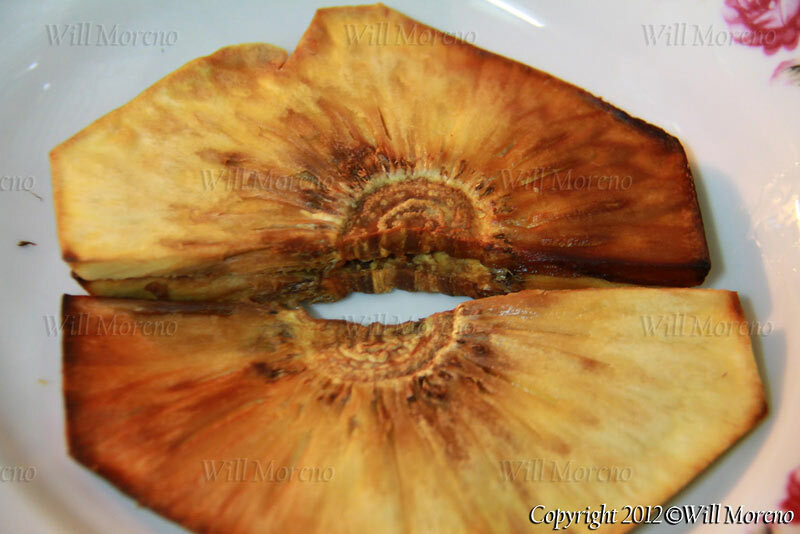 When you cook the breadfruit it tastes somewhat like potato, or similar to fresh-baked bread. In reality, it takes the flavor of whatever you cook it with, so sometimes its prepared with coconut milk or with different kind of meats. When you are selecting a breadfruit from the tree if you choose a green fruit, its green and hard on the exterior with small raised black spines and the interior is white in color and on the inside it would be very starchy and somewhat fibrous. When fully ripe, the fruit's external color remains the same but is somewhat soft, the interior would be cream colored or yellow and pasty, also sweetly fragrant. Belizeans in Belize for years have been eating Breadfruit not knowing that it was actually introduced as a food for the slaves. It is often prepared by cutting off the outer skin and cutting the fruit into slices, then deep fried to give it a crisp texture. 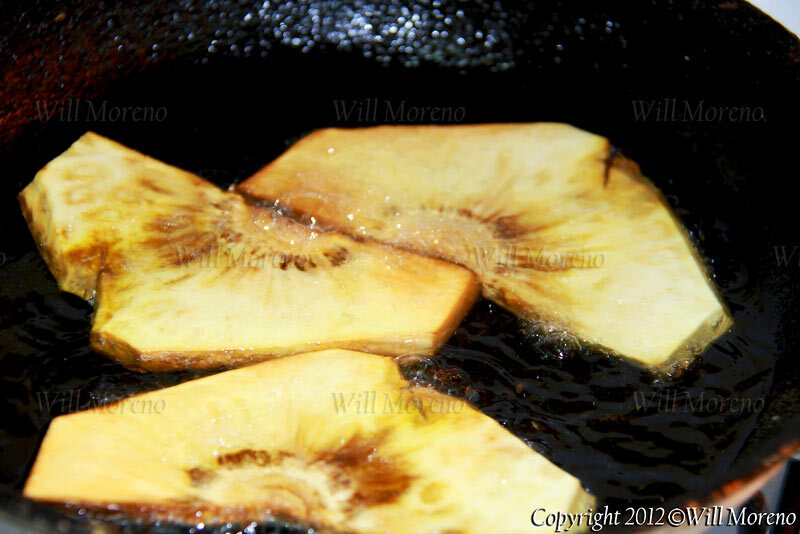 The amount of crisp on the fried breadfruit depends on the thickness of the slices. Is this making you hungry yet? Then it's not too late because breadfruit is still in season in Belize. 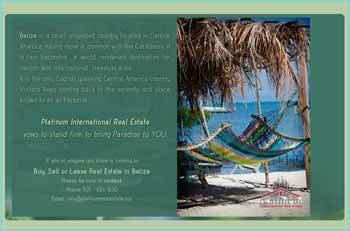 Come to Belize and enjoy the culinary experience. Beautiful tropical breadfruit trees are very well-adapted to Belize’s growing conditions including the rainy season; however, they can get water-stressed, resulting in partial defoliation in the dry season months but the tree continues to grow and bear fruit. 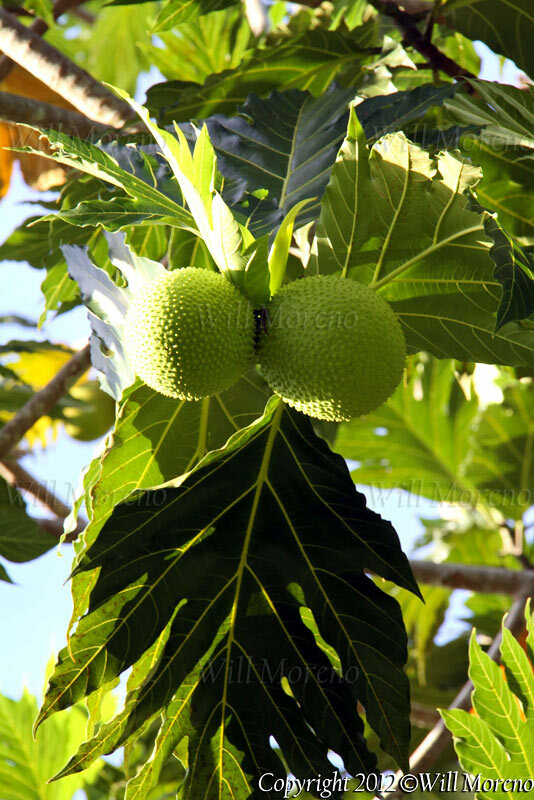 The breadfruit tree has an exotic, lush tropical appearance due to its very large, lovely, lobed leaves. Breadfruit, (Artocarpusaltilis) is in the plant family Moraceae. 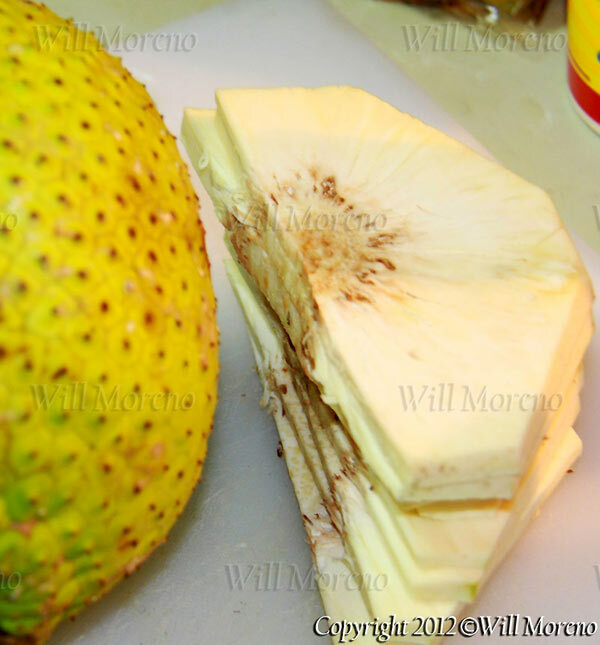 There are both seeded and seedless breadfruit varieties. Other cultivated Artocarpus species include Artocarpuscamansi, known as breadnut; A. heterophyllus, jackfruit, and A.integer, champedak. Another relative of the breadfruit called dugdug is A. mariannensis, and the popular marang is A. odoratissimus. The seeds in all Artocarpus species may be boiled or roasted; they are both starchy and delicious. When breadfruit is mature but still firm and starchy it can be sliced the thickness of bread and buttered and fried for a bread/toast substitute (the thinner the slice, the crisper the chip). However, this versatile fruit may also be cut into chunks and steamed, boiled, baked, or roasted. The cooked fruit is puffy and similar to bread or buns, thus its name. Immature, young and very green fruit may be boiled and reportedly tastes like cooked artichoke hearts. The people of the Pacific islands roast the whole, starchy, mature green breadfruit on pre-heated rocks in an outdoor underground oven. Fully ripe breadfruits, both sweet and soft, are eaten as dessert fruits; they may be eaten raw, cooked or baked. Breadfruit is native to a broad area of the western Pacific, near Papua New Guinea and the Malay-Indian archipelago and has been widely grown in the Pacific islands and the Philippines for thousands of years. Breadfruit trees yield large amounts of fruit and may have a productive life of more than 80 years. Having been carried by travelers, breadfruit plants have been planted throughout the tropical Americas and the Caribbean islands. First introduced into Jamaica as early as 1784, it is commonly grown there both in dooryards and in small commercial plantings. Currently, there is a renewed interest in large scale breadfruit production in the Hawaiian islands, where breadfruit is called Ulu. 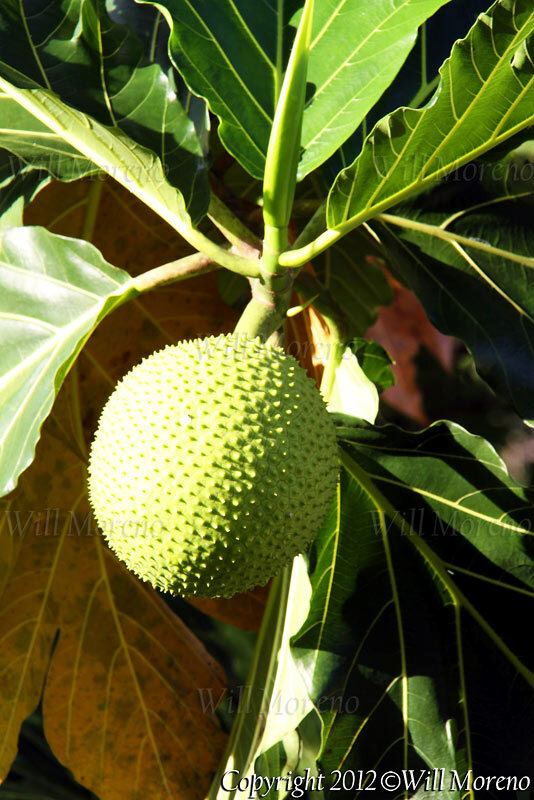 Many thousands of breadfruit trees have been planted, and fruit production is used both fresh and in value-added products, notably breadfruit flour. Current information on breadfruit cultivation may be found on the website of the Breadfruit Institute in Hawaii, a non-profit educational institute: www.Breadfruit.org . Seed is planted to multiply the seeded breadfruit varieties. But propagation of the seedless breadfruits is done vegetatively, generally by severing root suckers from the mother tree. This may best be done in stages, so that the young sucker develops roots of its own in place before full separation from the mother tree. Air-layering or marcotting is another method used for propagation; marcotting is best done when the plants are actively growing. Also, root cuttings of 3-4 cm diameter that are 12-30 cm long may be propagated in sand or a well-drained organic potting soil. Both male and female flowers are on the same tree, and pollination is assured by wind and by insects of many kinds. Breadfruit trees planted in the field grow rapidly in size. Its soft wood may be easily pruned for tree height control and for a good selection of sturdy horizontal limbs. Generally though, our dooryard trees in Belize are very large and are not pruned, and this makes harvesting challenging. Still, a broad and spreading low tree canopy may be developed with some judicious pruning cuts. Mature breadfruits are ready for harvest about three months after flowering, exhibiting a yellowish color break as the sections, or eyes, seem to spread open. When mature, skin texture is less pointy, and becomes more smooth and flattened. Natural skin cracks begin dripping small amounts of sap. The color of the fruit stem also becomes more yellow-green. Breadfruit is an excellent tree in traditional agroforestry systems, and many other food plants such as banana, cacao, taro, and soil-building legume crops such as perennial peanut (Arachis spp.) and Lablab bean (Lablab purpureus) thrive as companion plants. Short term vegetable crops such as tomato and pepper or quick perennial fruit crops such as pineapple and papaya may be planted between young breadfruit plants. Diversity created in agroforestry systems is environmentally sound and beneficial to the broad ecosystem; yields are more continuous, nutrients are shared and conserved, and pest pressure may be minimized.